At Spoonflower, we print orders on long rolls of fabric. The left and right sides of the design preview you see on our site are parallel to the selvage edges of the fabric, which are the finished edges that run the whole length of that roll. That left-to-right dimension is the width of the fabric. 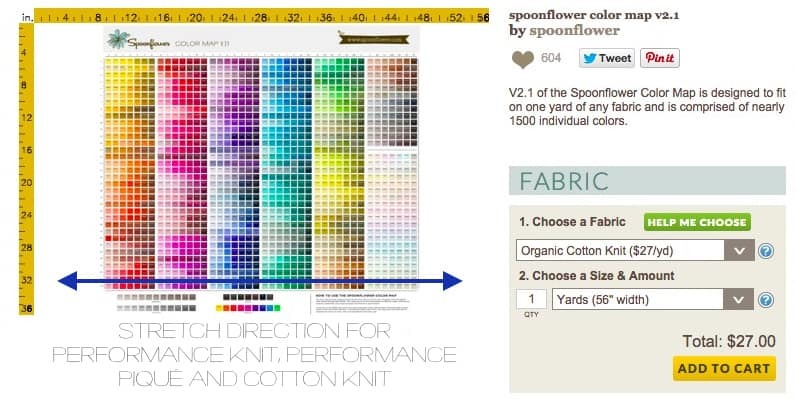 If you order more fabric, the width of your design will never change. Only the length, which increases vertically in the preview. We align all designs to the bottom left corner. 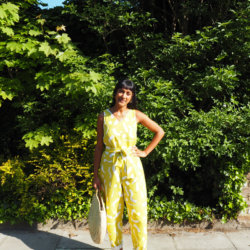 If your design is too big to fit in just 1 yard, don’t worry! 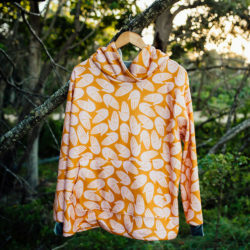 You can order 2 yards to receive the complete image. Just remember: what the preview shows is what you’ll get, so if it’s cut off in that preview, you may need to order more fabric. 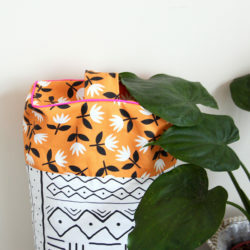 You can find the widths for each of our fabric bases (and wallpaper and gift wrap!) on our Product info page. 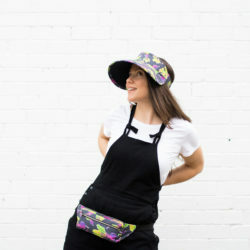 But when you receive your Spoonflower order, you may find that there are a few inches of blank, unprinted fabric on each side of their design. Don’t worry! 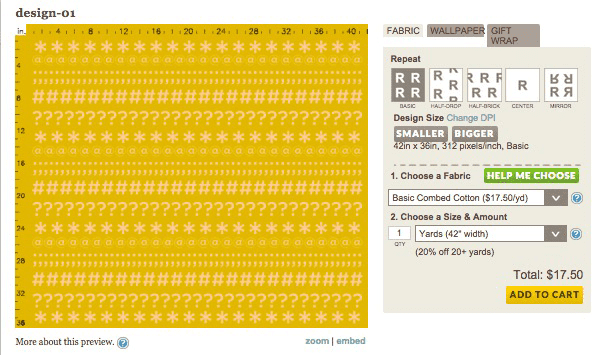 The width we show on our site is the printable width, or the amount of fabric printed with your design you’ll receive. For example, our Kona cotton has a width of 42 inches. You can create your design or order a design from the marketplace that fills all 42 of those inches–no need to account for a selvage or print space around your design. The rolls of Kona cotton that Spoonflower receives from the mill are all slightly wider than 42 inches, however, so you’ll receive 42 printed inches and a few inches of blank space. 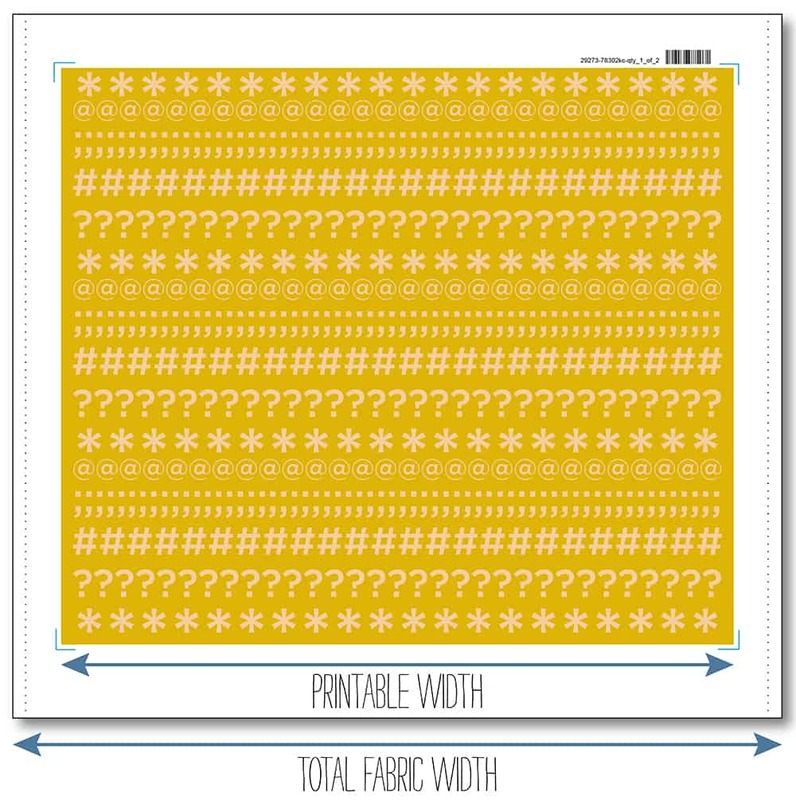 The same is true for fat quarters and swatches; you’ll find a small amount of blank space around each printed order. You’ll also see a string of numbers in the upper right-hand corner. These help us keep track of your order and make sure it makes it to its final destination safely! If your project requires a fabric with a bit of stretch, we have four great knit fabrics that are perfect for anything that needs a little flexibility. But if you want to make sure your giraffe design stretches taller, not wider, you’ll need to make sure your design runs in a certain direction. Most of our knits stretch along the cross-wise grain. That means if you hold the selvage edges in your hands (the left and right sides you see on our preview), you’ll get the most stretch. Our Modern Jersey is a 4-way stretch, and stretches in both directions, so you can’t go wrong! 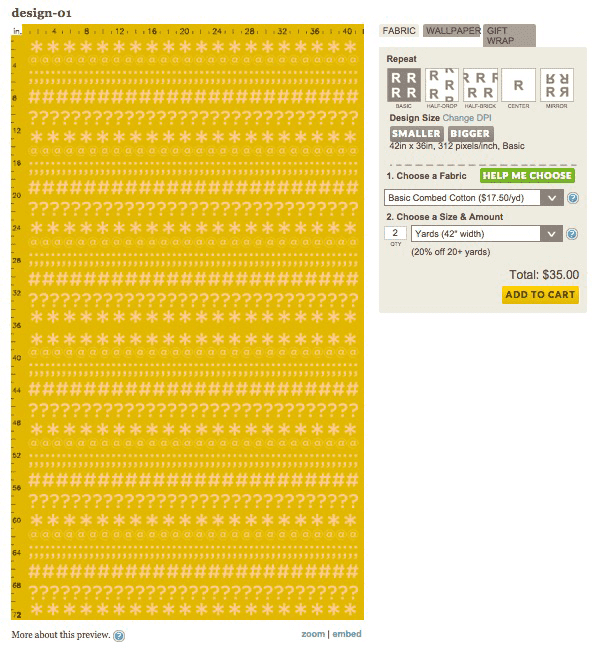 Hi, I’m trying to print two sets of repeating patterns on a yard of fabric. Spoonflowers yard is 36”x42”. I would like to split it so that I can get two 18”x 42”scarves. However, I want to print different repeating patterns on each (my own design) How do I prepare a file like that in photoshop? For a project like yours, we recommend using our newest feature, Fill-a-Yard™ If you choose the horizontal split yard option, you’ll be able to place two designs on 1 yard of fabric. 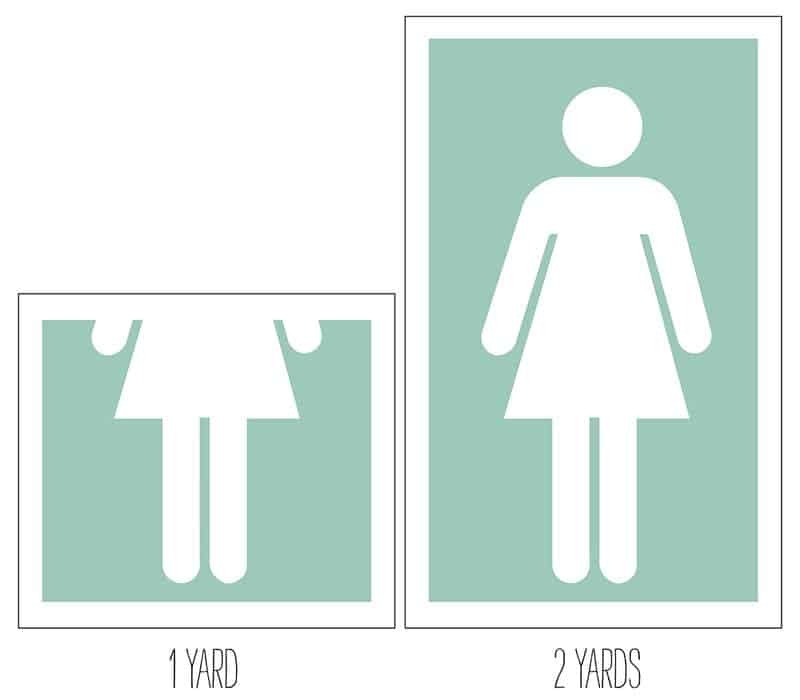 Please keep in mind you’ll want to choose a fabric with a set width of 42″ to ensure the scarves are your desired size! There is also a scarf Fill-a-Yard project!